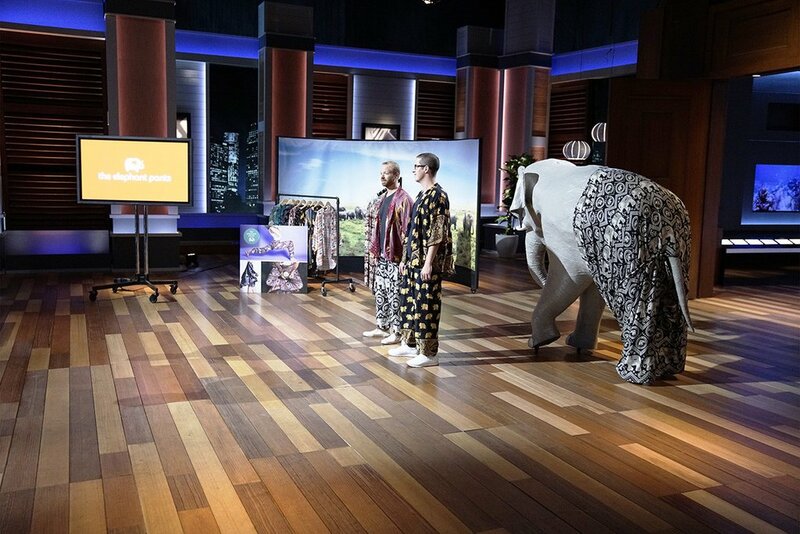 Nathan Coleman and James Brooks are two college friends who walked into the Shark Tank and asked for $500 for 10% stake in their company called The Elephant Pants that sells all types of comfortable pants, tops, and accessories for men, women, and kids. Nathan and James always love elephants as a kid. In 2013 they went over to Thailand as tourists and witnessed the elephants were beaten and literally chained to the trees in the sanctuary. Since then they went on a mission to create a business and donate 10% of the net profit to save these elephants. The company opened its door in 2014 and sold over 400,000 pairs of pants and donated over $127,000 to organizations who help the elephants. When the Mark Cuban asked the big question who would wear these pants, they said the demographic was currently for 18-24-year-old females. Kevin O’Leary interrupted and said men would also wear those pants too and went on to tell a story about how his family moved to Cambodia in the late 60s and lived there for 2 years and how fishing pants were a standard for him. When Robert Herjavec asked what their sales were, Nathan and James said they have done over $7M in the course of the two years in business which surprised all the sharks. The retail price was about $24/pair and 95% of their sales came from their eCommerce website and 5% wholesale. The main method to get traffic to their site was Facebook advertising, social media marketing, influencers and affiliate networks. Their strong growth came from advertising. One of the months they did $430K in sales and spent $75K on advertising. They need the money from the sharks to spend more on marketing and they also need the strategic values that the investors bring. Robert was very impressed by their story. Robert was out with the reason that he didn’t like the product. Mark was out because he said their success relied on Facebook marketing which is a risk factor because Facebook can change their policy anytime and they can go out of business. Kevin made 2 offers: $500K as a line of credit and 5% equity fee to set it up. The other offer was $500K for 20% straight equity. Daymond also made the same offer of $500K for 20%. Lori wanted to partner with Kevin with the offer of a line of credit at 12% interest rate and 10% equity. Final Outcome: Nathan and James made a deal with Daymond with his offer of $500K for 17.5% and a happy dance. The company continues to grow and launch new products with different designs. The company now produces a lot of different products with great designs including harem pants, loungers, stretch pants, pleated pants, Yoga pants, shorts, Kimonos and many more. Their clothes are very comfortable to wear and don’t forget a good portion of your money spent is used for a good cause.